They say the eyes are the window to the soul. Why wouldn't you want to choose the best frame for that window? Every woman dreams of rich, thick lashes. But do those fiber lashes really work? Check out Gather Your Girl's Moodstruck 3D Fiber Lashes review to find out. Want your lashes to look like this? Enter our giveaway. 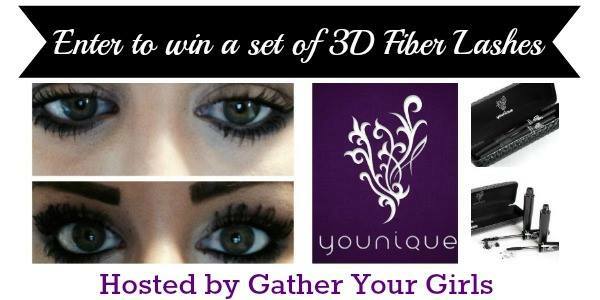 One lucky winner will receive a set of their very own 3D fiber lashes. The giveaway will run from October 12 through October 26, 2014 and is open to US residents, ages 18 and older. Entries will be verified. Winners will be notified via email.Wwinner will have 48 hours to respond and claim prize or another winner will be selected. I like the Refreshed Pure & Natural Rose Water but so much more! The Get up and go is sooo pretty looking..love some full lashes!